All the amazing flavors of a pumpkin spice latte, in fudge form! Line an 8-inch square baking dish with foil and spray with non-stick cooking spray. 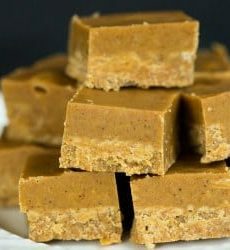 In a medium saucepan, stir together the sugar, evaporated milk, pumpkin, butter, espresso powder, salt, cinnamon, ginger, allspice and nutmeg. Place over medium heat and bring to a boil, then boil for 12 minutes, stirring often. Remove from the heat and stir in the white chocolate chips and marshmallows until melted, then stir in the vanilla. Pour into the prepared pan and place in the refrigerator until set, about 30 minutes. Cut into squares and store at room temperature or in the refrigerator in an airtight container for up to 2 weeks. Note: You can substitute 2 teaspoons of pumpkin pie spice for the cinnamon, ginger, allspice and nutmeg.